I had a bag of unfrozen magic meat left over from my OAMC session. The problem for me with OAMC is that I really don't want to cook dinner for a few days. I had a few leftover peppers and magic meat..hey why not? It's not in our freezer book as an option for stuffed peppers..so hey a new idea! I added a can of black beans (Bush's beans of course) - drain & rinse the beans and add the mix. I cut peppers in half length wise vs just popping the tops off. I did this to make it easier for kids to eat. Also, I added mozzarella cheese on the top and wanted to cover the meat topping completely. 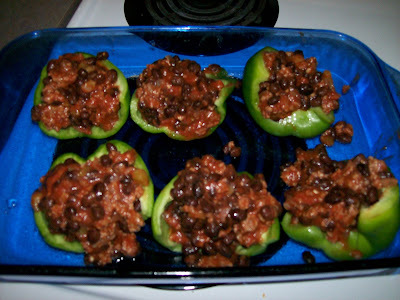 For peppers - use 1 lb magic meat, 1 can black beans, 3 peppers in half & cheese to your delight. Bake at 350 for 30 minutes. I left mine uncovered, but I think this can go either way. Add cheese after 30 minutes until melted. Kid rating: both of my kids ate these up! DD ate the pepper & meat (she's such an unpredictable eater), then DS ate all the beans and a few peppers. This looks yummy! I'm going to try this but I thinking that I will add some rice to the mix! My family likes stuffed peppers with rice instead of beans as well.